Planta™ is unlike any other plant protein you’ve tried. There’s no grainy texture, no aftertaste, and it mixes flawlessly in water, milk, or any non-dairy alternative. We refused to release a single flavor of Planta™ unless it tasted delicious and mixed easily. We created dozens and dozens of batches of each flavor until it was absolutely perfect. Now, we can confidently say that Planta™ is probably the best-tasting Vegan-friendly plant protein in the world. Planta™ contains 20g of protein from Organic Peas and Organic Brown Rice. It has 0 sugar, 100 calories, and 27 vitamins and minerals. Plus, Planta™ is packed with 1g of Vegan-friendly BCAAs at a 2:1:1 ratio using our proprietary SunBCAA™ formula. You can use Planta™ in shakes, pancakes, oatmeal, yogurt, and more. Planta™ is perfect for anyone who wants to get more Vegan protein in their diet, build muscle, burn fat, lose weight, and stay healthy. Planta™ is used by everyone from pro-MMA fighters, USA Olympic athletes, and pro athletes to bodybuilders, fitness enthusiasts, and parents. * %Daily Value (DVnot established. Directions For Planta: Mix 1 scoop of Planta with 10-12oz of water or the beverage of your choice. 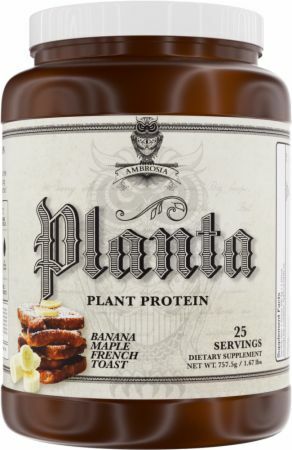 Planta can be spoon stirred in a glass, mixed in a shaker bottle, or blended to create a smoothie. Consume 1-3 shakes throughout the day as needed to meet your protein intake needs. Warnings: This product is only intended to be consumed by healthy adults 18 years of age or older. Pregnant or nursing women should not use this product. Consult with your health care provider before using this product, especially if you are taking any prescription, over the counter medication, dietary supplement product or if you have any pre-existing medical condition including but not limited to: high or low blood pressure, cardiac arrhythmia, stroke, heart, liver, kidney, or thyroid disease, seizure disorder, psychiatric disease, diabetes, difficulty urinating due to prostrate enlargement or if you are take a MAO-B inhibitor or any other medication, including but not limited to MAOIs, SSRIs or any other compounds with serotonergic activity.